A notoriously flood-prone intersection in east Fort Worth is fully open for the first time in nearly a decade after much-needed stormwater improvements. 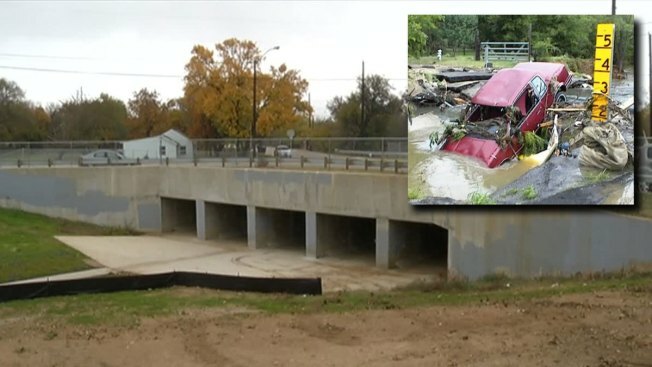 The changes to the intersection of East Butler and McClure streets, just east of Interstate 35W, are a big relief to residents and a family that was devastated by flood water. A spot along East Butler Street will always hold painful memories for Allen Abrego. It's where he lost his two sons, Felipe and Jacob, both toddlers, and their mother, Rosalin Guerrero. She was hesitant about driving through high water but followed a van into the waters the night of April 30, 2004, Abrego's birthday. But the car she was driving was swept away, and all three died. "It took a while, but I overcame the pain and sorrow," Abrego said. There was nearly more sorrow two months later, when another vehicle was swept away in June 2004. Fortunately the driver left the vehicle before it damaged McClure Street and got stuck in the drainage system just off the side of the road. Abrego said he is happy to see the improvements. "[It is] very satisfying that I don't have to worry about another family going through the same thing," he said. Abrego is also touched by how the city is setting up a plaque to remember Guerrero, Felipe and Jacob. "Ultimately, the cost was their lives but, like I said, I'm satisfied with this, these improvements," he said. The tragedy on East Butler Street sparked changes at problem areas throughout the city. "Before this event, we didn't have resources devoted, dedicated, to addressing stormwater issues in a large way," said Greg Simmons, assistant director of Transportation and Public Works' Stormwater Management Division. The city created the stormwater management department and, since 2007, has spent $104 million on stormwater projects, including $1.75 million on the McClure and Butler intersection. Jose Morales, who has lived closest to the intersection for 18 years, calls it "the river of death." He said he feels much better about it after the improvements, saying they are "very good for everybody." Fort Worth still has millions of dollars in stormwater needs across the city. The most hazardous areas are being addressed first, but Simmons said it could take years to complete all the needed projects.